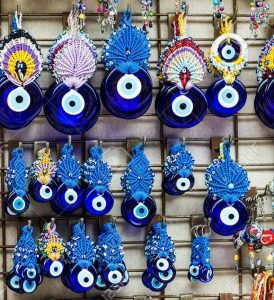 The use of the Evil Eye Trinket and other similar symbolic items has been seen in the ancient civilizations dating as far back as 3000 BC all over the globe! Although the symbol did transcend the cultural, geographical or religious boundaries and found widespread use, it saw is beginnings essentially with a view to protect new born children from evil intents of others who had an “evil eye”. In ancient civilizations, there were many child deaths because of diseases not known (for which we have vaccines these days), due to which the deaths were attributed to the “evil eye” of certain people who did not have children or did not mean well. With time it trasended to rich business people (mostly traders) who lost their wealth due to “evil eye” of their rivals – which actually was due to various other reasons (natural causes like fire, weather, poor business decisions, etc). 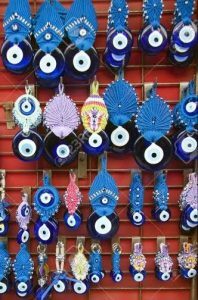 The evil eye trinket was “energised” by the witch doctors of the tribe in ancient civilizations and later by religious heads before giving to anyone for use. The present resurgence is however due to the use by well known personalities like Kim Kardashian, fashion model Gigi Hadid, etc. This recent endorsement from A-list celebrities has resulted in the surfacing of countless online tutorials for making your own evil eye trinkets like bracelets, necklaces and keychains. From a well intended protective belief system, this has now become a fully commercial activity, mostly catering to the inner fears of people. Of late, you find it being sold as a good gift item but, in reality its meaning is beyond a mere trinket or fashion statement. 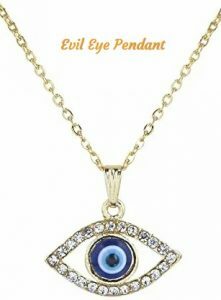 The evil eye trinket has the potential to attract attention which is exactly what anyone would want to avoid to keep away people (read enemy) with evil eye. Thus displaying it, as many people do these days, serves a counter purpose. The evil eye is a remnant from ancient civilisations, based on some of the humanity’s most profound beliefs of those days. It should definitely not be worn as fashion statement and also discontinued after the purpose has been served. Just as we should not wear any crystal or precious stone without proper advice or intent, to wear an amulet flippantly without such knowledge may not only render its protective abilities useless, but also liable to incur an even more potent curse.